I finished this off tonight, just in time to take to work with me, although if the night shift is anything like last, it will be too warm to wear it! The boiler is fixed too!!!!!!!!!!!!!!!!!!!!!!! Ok, off for food then to work. One down, five to go!!!!!!!! Thats lovely! And it fits like a dream. 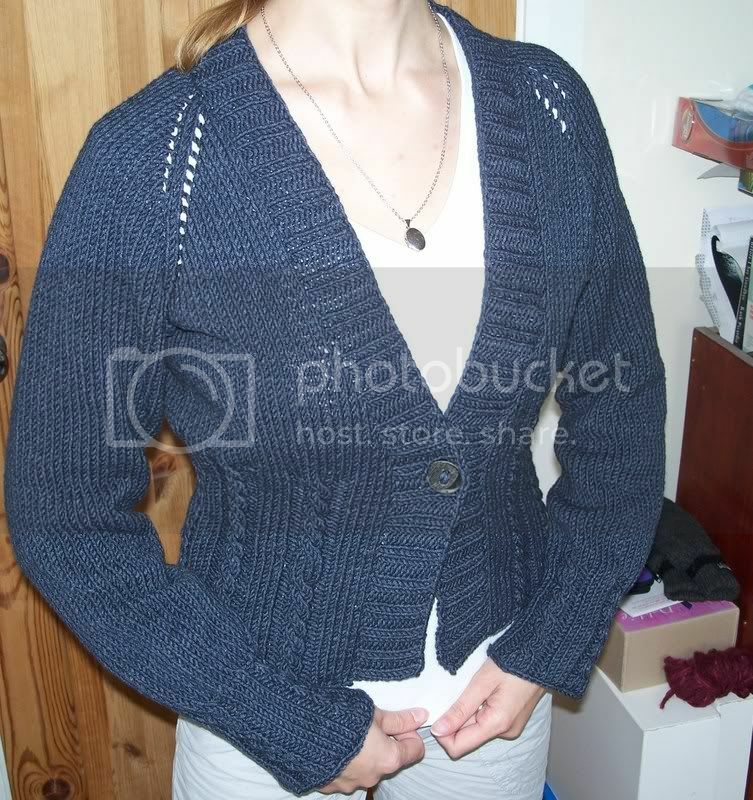 I love your cardi, I keep seeing them around blogland and it looks a great pattern. Enjoy the hot water again! Lovely Cardi, and looks super with longer sleeves, perfect for our interchangable weather. Glad to hear you now have hot water. Looks brilliant on you - a great fit! I've toyed with knitting this pattern, and I'm going to queue it now after seeing yours (don't think it'll look quite as good on me though!). Glad your boiler is finally fixed. mr Greenjeans looks fab, such a good fit. This looks like a seriously good pattern & is great on you. Glad the boiler is fixed with warmer weather forcast! Love that cardi - should be so useful and snug though I'm glad that the boiler fixing means the need for snugness is slightly less pressing! Urchin and Montego Bay are both also real beauties.